Today is the 33rd anniversary of Elvis Presley's passing. Only the funerals of John Lennon, Princess Diana and recently, that of Michael Jackson's, have surpassed the "Kings" in all the attendant hoopla incurred by their deaths. No matter what you might think about him, the man had "it." Last year alone his enterprises generated something like $98 million. Not bad for a dead guy! This photo, one of 28 taken on December 21, 1970 by Otis Atkins, shows Elvis meeting President Nixon prior to being presented with the badge of a Federal Narcotics Officer. The story behind this extraordinarily strange event has been told in pieces here and there over the years, but Jerry Schilling's is, of course the best, his having been there, but if you are unfamiliar with it, I'll give it my best shot. Elvis left Graceland on the night of December 20th, 1970, after a fight with his dad, Vernon, who was angry that Elvis had bought 10 Mercedes-Benz' as Christmas gifts for his friends. Looking to finalize a project he had been working on in his mind for several months, Elvis decided to go to Washington, D.C. for a final decision on his proposal. But, the "King" wanted to go incognito. Outdoors, and with no cash (Elvis never carried cash) he headed to the airport to get a commercial flight. Having no ticket and no money was not a problem, as the "King" he was "comped" to the flight. On board was a United States Senator. They talked about the Vietnam War and the "hippie problem" and the bad influence that drugs were having on the youth of America. Elvis had just had this same conversation with Vice President Spiro Agnew two weeks earlier, in an effort to obtain a Federal Narcotics Officer's badge. Agnew, in one of his rare sane moments, diplomatically rebuffed him, stating that he would "look into the matter" for him. As of December 20th, Elvis had heard nothing. With the New Year approaching, Elvis wanted this done. Flying to L.A., he met longtime friend and associate Jerry Schilling, whom he had awoken earlier by phone, instructing Jerry to meet him with $500 cash for travel to D.C. But even before they left the L.A. Airport, Elvis had gaven the entire $500 to a serviceman returning home from Vietnam in order to help him get home. 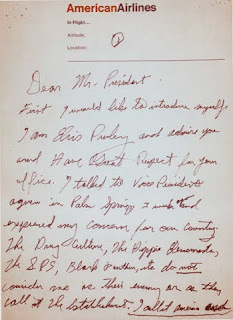 Once again, being the "King" paid off, and he and Jerry Schilling were "comped" on another night flight, this time to Washington, D.C.
On this flight Elvis wrote a 5 page letter outlining his concerns for American youth and his desire to meet with the President and become a Federal narcotics Officer. Landing in Washington they were met by another of the "Memphis mafia", Sonny West. At Graceland they had been going insane looking for him. When Elvis did call they dispatched Sonny West to meet him in D.C. From there the trio headed to the Washington Hotel where they registered as Jon Burrows (Elvis), Jerry Schilling, and Sonny West, staying in Rooms 506, 507 and 508. At about 6:30 AM, now remember, Elvis had only left Memphis around 6 PM the night before, so they had been traveling all night, Elvis arrived, alone, at the White House gates, handing the guard his note. 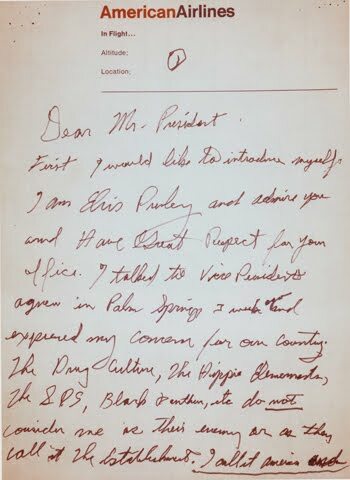 The guard, who must have been sleeping not to recognize Elvis, assured him that his note would be deliverd. Elvis went back to the hotel to do some more drugs, I mean, catch up on his sleep. By 9:30 AM, Bud Krogh, one of Nixon's top aides, had received the message. Realizing the potential publicity of such a meeting he immeditely contacted the Washington Hotel and had Elvis and his freinds driven to the White House. Arriving at the White House, Elvis was patted down and a .45 calibre automatic was found in his cape. This was the surprise he had for the President! Other versions of the story have Elvis whipping the pistol out after meeting Nixon. Since Mr. Schilling was present at the time, I will stick with his version of the events. Initially, only Elvis was allowed in to see the President. The security protocol was 2 Secret Service Agents per vistor, with limits on the number of visitors at one time, not counting Bill Signing events, at which many people are present. The difference is, of course, that those people have been pre-screened for access. This rule was waived for Elvis and photos show the two clearly delighted to be in one anothers presence. They also discussed the problem of foreign influences upon America's youth. A prime example was the influence of The Beatles on young people to experiment with drugs. Elvis and the President were equally concerned about the effect that drugs were having on our culture. Ironically, both had severe problems with sedatives such as Seconols and other barbituates. In Elvis' case, this would later cost him his life. For the next 45 minutes Elvis had the run of the Oval Office. The President was so agog with having him there that he rummaged through the drawers finding White House pens and pictures, along with Presidential tie clips (Elvis never wore ties) and anything not nailed down, to give Elvis as presents for his friends and family. 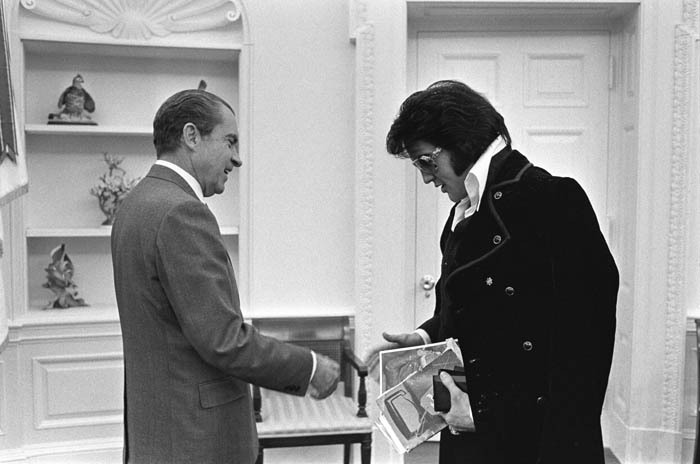 When Elvis admired an oil painting on the wall, Nixon actually offered it to him. His aides had to make the President aware that it was not his to give away. The President informed Elvis that he would need several hours to arrange the paper work, so after posing for a series of photos Elvis left to wait on his badge at the Washington Hotel, rooms 505, 506 and 507. By 3 PM the Federal Narcotics Officer badge, which he craved so much, was delivered to him. He was now permitted to carry narcotics and weapons across state lines. Not a bad mornings work.